It seems like the lines between marketing departments blur a little more each day. Modern marketers must understand these overlaps and how they affect their daily tasks. In my experience, SEO professionals and content marketers deal with this the most. You’ll certainly find differences, but you can’t ignore the similarities. Content rich sites generate 97% more links. Why? Because when you have more content, there’s more for others to link to. There’s not much of a reason for people to link to your homepage or About page. They may, at some point, but those scenarios are few and far between. On the other hand, actively producing content creates an arsenal of material that others may find helpful, useful and beneficial. When that happens, they’ll want to link to you. It’s the SEO dream come true. Building links to your site without any prodding on your part. Publishing and promoting a deep industry resource. Create a landmark article that goes deeper than anyone else on a specific topic. Your goal is to make this the go-to resource that everyone in your industry looks to for information. And when they’re looking at it for information, they’re linking to it too. Submit guest posts to top industry blogs. Forget about the panic that happened when Matt Cutts announced that guest posting was dead. High-quality, strategic guest posting is still alive and well. It’s all about creating valuable content first and reaping the link-building benefits second. Land implied links through media mentions. Online press releases don’t generate high-quality links, but actual media mentions do. Google calls these implied links, and they help build brand authority. As Google continues to evolve, I believe we’re going to see this become more and more important in the SEO world. At the end of the day, the only way to get that link — the real SEO gold — is by publishing content that deserves the link. Since 2004, long tail searches have increased by 68%. That said, given low search volume for many of these phrases, it wouldn’t make sense to focus all your SEO strategy on long tail keywords. There’s no reason to spend your technical SEO optimization energy trying to rank for something that only gets a handful of searches a month. It’d be a real waste of time. 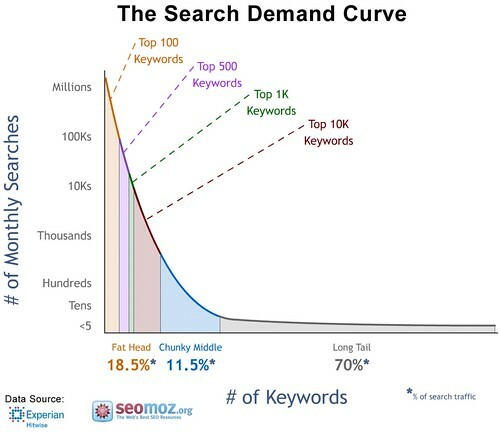 And yet, long-tail keywords tend to account for a large portion of search engine traffic. How can you take advantage of the long tail? Through content marketing. When you’re writing in-depth, valuable content, you’ll naturally use several variations and formats of different keywords related to the article topic. In fact, you may not even realize how many long-tail keywords you’re using — but the search engines will. Each of these suggestion areas gives you a good place to start when looking for long-tail keywords. Keep drilling down using the suggestions and you’ll stumble on some great ideas for phrases to incorporate into your content. UberSuggest removes the manual labor from the Google Suggestion method by automatically running through the suggestion system and giving you the related keywords. The suggestions from these tools do more than just give you ideas for long-tail keywords. You’ll also find great ideas for new topics that you haven’t covered yet. Don’t shy away from keyword research just because SEO isn’t your thing. Great content marketing naturally encourages high numbers of social media signals. When you’re publishing engaging, high-quality work, people will want to share, follow and mention you. And, according to a study by Searchmetrics, that’s directly affecting your rank. Publishing content that people want to share can increase your rankings. It all goes back to knowing how to create things that engage your audience. So, the next time you write something and get excited about the social shares it gathers, remember that you’re helping out the SEO team too. Maybe they’ll even buy you a cookie. Last, but certainly not least, content marketing helps boost SEO because it keep your website fresh. Google loves fresh content, and it’s been that way for a long time. Exploring that idea a bit more, statistics show that, on average, websites with blogs have 434% more indexed pages. Content marketing requires consistent output, and so does SEO. That’s right, content marketers — there’s yet another reason that you need to stick to your editorial calendar. It helps boost your SEO, ultimately leading to even more visibility for the content you’ve created. Now that you understand how content marketing boosts SEO, what will you do to implement it? Are there any areas of your content marketing game that you could strengthen in a way that would also fortify your SEO? I’d love to hear your thoughts in the comments below! Header image credit: Canva & Picjumbo. All images, unless otherwise stated, are from the website mentioned in the particular section. Aaron Agius is an experienced search, content and social marketer. He has worked with some of the world’s largest and most recognized brands, including Salesforce, Coca-Cola, Target and others, to build their online presence. See more from Aaron at Louder Online, his blog, Facebook, Twitter, Google+ and LinkedIn. write my research paper for me. I’ll pay for that. Looking forward to hear from someone. I found your post from the SEL round-up of best SEO pieces on the Web, and they were right: great job! I like what you say about Google Suggestions. I would encourage SEMrush subscribers to go a step further if they have a lot of content on site. I've written on here and done a webinar here, but the root of doing advanced research on content planning lies in looking at related keywords. Find who ranks top 5 for different iterations of a topic or entity. Then search that page/URL in SEMrush to find what also ranked from the page. Compare several "authority pages" on the topic that were top 5. How many times do phrases occur on multiple pages: that's your key to "scoring" how close a phrase or theme is to the main topic you searched. Hope that helps expand on your "Google Suggestions" ideas: they are spot on for those that don't want to do the research in depth for dozens of new or revised pages. Sounds like another SEMrush blog post in the works :) Thanks for your comment, Eric!